We’ve tested 130 lenses on Canon’s flagship camera, the full-frame 18-Mpix Canon EOS-1D X Mk II, covering focal lengths ranging from an incredibly wide 11mm up to a super-telephoto 600mm. We’ve split the results between primes and zooms and then arranged them into three groups according to use. This equates to ultra-wide and wide-angle, standard, and telephoto to help you narrow down the best performer in each. However, this time we’ve compared lenses from the perspective of the camera’s intended market — the photojournalist. While they’re not really any different from the next photographer when it comes to choosing focal length, there are some models that perhaps require further consideration. We’ve tested 130 lenses on the recently-introduced full-frame 30-Mpix Canon EOS 5D Mk IV, covering focal lengths ranging from an ultra-wide angle 11mm to 600mm super-telephoto. The EOS 7D Mark II is Canon’s flagship APS-C sensor DSLR, boasting a 20Mp resolution and a host of high-end features. It’s a popular choice for many serious enthusiasts and semi-pro photographers, so we’ve tested over 300 lenses on it to help you pick out the best one for you. In this first part of a two-part review, we round up the best zoom lenses for the Canon EOS 7D Mark II. Canon EF 100-400mm F4.5-5.6L IS II USM review: Worthy upgrade? 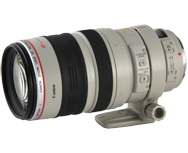 The original stabilized EF 100-400mm f4.5-5.6L IS USM was a favorite of wildlife and action photographers, but as one of Canon’s oldest telephoto zoom models, a replacement was well overdue. Announced towards the end of last year, the updated model features a completely revised optical formula and replaces the traditional one-touch control mechanism with a conventional two-ring design. Read on to find out how well this new model performs. Canon has updated the original 400mm f4 DO lens using its new gapless diffractive optics construction, which promises high image quality. Read on to find out how well this new model performs. Canon has announced an updated version of their compact super telephoto zoom lens. The new EF 100-400mm f/4.5-5.6 L II USM boasts a number of upgrades over its predecessor, which Canon claim improve both the image quality and handling of the new version. We preview what this latest lens has to offer and see how the original version performed in the DxOMark Lens tests. Tamron has released a new modestly priced, stabilized super-telephoto zoom for both full-frame and APS-C cameras, the SP 150-600mm f5-6.3 Di VC USD. How does this $1,100 model compare against the slightly shorter-range Sigma and Canon offerings? A favorite of wildlife and action photographers, Canon’s EF100-400mm f4.5-5.6L IS USM is a well-specified and versatile model. However, as it approaches sixteen years in production, is it still capable of competing with more modern offerings? Read on to find out. Sigma are well known for their accessibly priced models and at just under $1,100 the 150-500mm f5-6.3 APO seems like a promising alternative to the premium offerings from the camera makers. Although one of the older models in the firm’s range now, does it still have what it needs to compete with more modern rivals? Sigma’s full-frame 50-500mm f4.5-6.3 stabilized telephoto zoom is a promising looking model for wildlife, nature and sports. At $1,660 it’s temptingly priced for a lens of this potential, but how well does the Canon mount version perform? Read on to find out.